Bedouin Mama: The Haze. Part 2. Almost a month ago I wrote a post about The Haze, that carpet of acrid smoke that has been blanketing south East Asia for the last few months. I had not expected to write about this subject again, simply because I had not expected it would be necessary. I thought The Haze was this annoying, well, more than annoying thing, that would dissipate in a week or so and then would be forgotten. We would go back to purchasing palm oil containing products until next year, when we would be annoyed again. That did not happen. The Haze is as bad as a month ago, so it is time for an update. What happened in the last month? The honest answer? Nothing. The haze is as bad as it was. The next question I like to scream out loud is: WHY? Just to briefly recap, what causes the haze is peat fires. The wetlands in coastal areas of Sumatra and Borneo are mostly peatlands, where decayed organic material has been deposited over centuries. These peatlands are being drained to be used for agricultural purposes (wood logging, paper production, mining, but most of all: palm oil plantations), leaving a highly dry and flammable organic material. Some companies (illegally) set fire to dried peatlands to clear them, but even without that, many still catch sparks and set ablaze naturally during the dry season. Peat fires burn underground, making them not only produce this acrid haze, but also very hard to put out. Peat fires produce more smoke and toxins than regular forest fires. While we here in Singapore struggle with unhealthy levels of air pollution (especially people like myself that suffer of auto–immune disease, or those that have long afflictions), in Sumatra and Borneo the haze levels are much, much worse. Levels of carbon mono-oxide and ozone are hazardously high. People and animals are dying. The Indonesian government is proposing to evacuate children from the affected area’s, which is great for them, but does nothing towards actually solving the problem. So why has the haze problem still not been solved? Apart from declaring a state of emergency months ago, the Indonesian government has done amazingly little. Why is not everyone linked to fires in jail? Why are open fires still allowed? Why is not a significant amount of money allocated to the fire-fighters working in the burning area’s? And, most importantly, why is the international press not making a stampede? - Human suffering: The health of 40 million people across South East Asia is affected, and many people have already died. - Ecological disaster: Areas of tropical rainforest are being swiped away, animals including endangered orang-utans are dying. - Economic damage: Indonesia itself estimated the loss of economic growth and damages to businesses was worth US$ 35 billion. Other estimates are higher, and these still not take into account losses in the wider region. Many people in affected area’s, which are already poor, have lost their livelihood. Agricultural yields in the whole region will be much lower as sunlight cannot reach the crops. Bee populations stagger, which will affect future crops badly. - Global warming: The amount of CO2 that has been emitted over the last few months by peat fires is higher than the whole of the US emits in one year. Summing up, this really is the largest ecological & humanitarian crisis of recent years. - This year’s El Niño makes for an extremely long dry season, predictions are it might not rain until early next year. What is really needed are monsoon rains to quench the fires. Putting out peat fires is a tricky thing, as basically the whole area needs to be doused with tons of water to be effective. Peat can burn up to 10 meters underground, and the smallest smouldering ember left behind will get the whole thing going again. 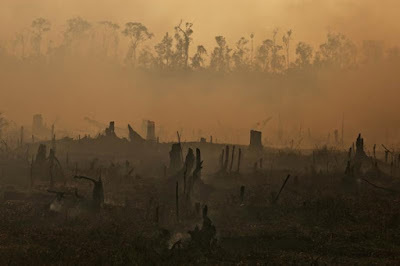 - Vast areas of peatland have been drained lately, so fires spread very easily and very far. - Not allowing open fires is more easily said than done. In rural Indonesia people mostly cook on wood fires, and burn their garbage since there is no waste collection. - Fire fighters on the ground are short of equipment, manpower, water and everything basically. For example, Borneo has 3 (!) fire fighting helicopters, a more daunting figure if you realise the surface area of this island is larger than that of France. - Indonesia is a developing (or let’s be honest: poor) country and it is hard to blame them for making economic development a priority. However, corruption in Indonesia is widespread, raising the question where profits really end up. The very powerful palm oil lobby is entwined with politics, and will inhibit finding a real solution. - Who cares about Borneo and Sumatra anyhow? Obviously neither the Indonesian government on Java, nor the rest of the world. When tsunamis and earthquakes strike, ‘rich’ countries donate millions. Now, when this is in reality a global environmental disaster that affects us all: nothing. A lot of people ask me: 'What can we do?' This is a question I ask myself daily as well. We can’t just keep complaining, can we? So what can we do? - Not buy products with palm oil in it (it is debatable whether there is such a thing as sustainable palm oil) and pressure companies into sustainable sourcing. Mind you, this is a long-term solution, not one that will help in the short run, if at all. The palm oil supply chain is long, and the product often ends up in unrecognisable derivatives, making it almost impossible for consumers to identify. A problem of this scale in my mind needs to be addressed by international policies, laws and regulations. As consumers, all we can do is to demand our companies and governments to implement these. - Donate to Indonesia’s fire-fighters. They need equipment, suitable protective clothing and masks. - Help the affected people on the ground. The majority of people in Indonesia do not have suitable facemasks (the Indonesian government distributes surgical masks only, which are proven not effective against haze.) The expensive N95 masks cost over a day’s wages for an average Indonesian. - Spread the word. We need to get the world’s attention for this global disaster. - We need to convince the government of Indonesia to stop developing peatlands. The international community and NGO’s should help Indonesia with looking for alternative ways grow the economy and create jobs, rather than simply judge them for burning their rainforest. If anyone has other suggestions, or knows of any charities that work on the ground and need funds or assistance, please give me their details and I will share their links. I find it shockingly difficult to find ways to support haze fighting-organisations, but I am sure they must exist.